Being against divestment is a reasonable position, though I think it is misguided. It is not unequivocally wrong in the way denying the existence of human-caused climate change is. Divestment is a question of strategy, and that is a legitimate topic of debate, but divestment is the stronger argument. The clearest negative to divestment is the cost to the college, but there are seemingly reputable studies showing that divestment can have an effect anywhere from actually gaining the college money to costing it a fairly significant amount. Other colleges have divested with hardly any financial cost, and partial divestment by switching to fossil-free funds, as is currently proposed, further limits risks. It is far from clear if there will be a significant financial cost to the college, but even if there were, there is no reason financial aid must suffer. There is also the argument that shareholder activism is the best strategy, but this falls short for three reasons. First, it is not clear if fossil fuel companies can be adequately reformed. We need to reach a point where we are not burning significant amounts of fossil fuels, particularly in rich countries. When these companies are so reliant on fossil fuels, it is hard to get around it. Second, universities constitute a relatively small amount of investment in fossil fuel companies. Even if they push for better policies, they will probably lose out to larger investors. Demonstrating that divestment is a serious threat will be more influential than pushing from within companies without any real teeth. Last, seemingly ethically-minded institutions have held investments in fossil fuel companies for quite a long time. I am yet to see evidence they have influenced companies in the way we would like. For the strategic positives, fossil fuel divestment is part of a relatively strong and growing global movement. Divestment only has strength when it is part of a broader movement, which is why we should not divest from everything immoral (nor would that be possible). 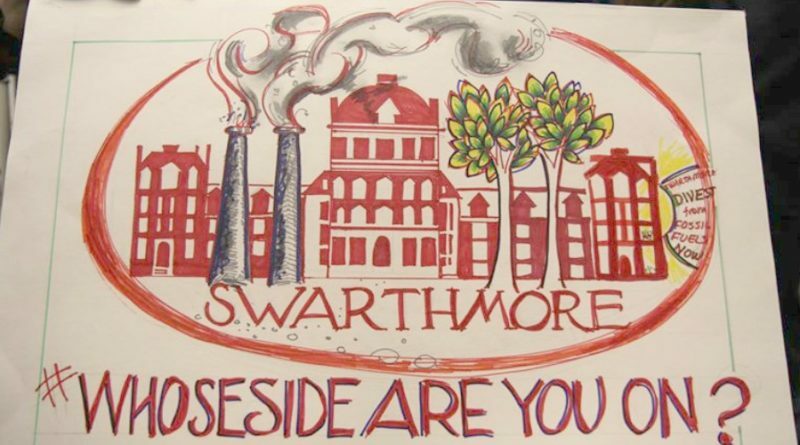 In this case, there is a movement, and Swarthmore’s divestment will contribute to it. And though the divestment movement is not yet going to challenge the financial viability of the fossil fuel industry, it does contribute normatively. This should not be written off. Shifting norms and popular conceptions of morality are a key part of any movement. We simply cannot keep burning fossil fuels the way we are, and reducing individual consumption is not enough. Systemic change is needed, and stigmatizing the fossil fuel industry is an important part of that. 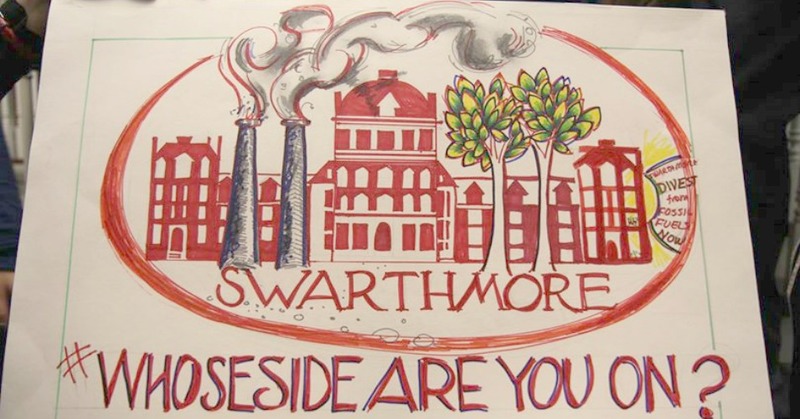 Divesting will join Swarthmore with a growing number of universities, religious institutions, and other organizations that are establishing the norm that fossil fuel extraction is an unsustainable practice, and in turn push others to support the political action against climate change that we need. Divestment is only a small part of the societal change we need, but it helps. Last, I think it is worth remembering just how devastating climate change will be. The cruelest irony of climate change is that those who least contributed to it and are least able to cope with it are those that will be most heavily hit (and already are being impacted). If we do not rapidly change course, we will see millions of subsistence farmers starve from disrupted agricultural patterns, huge numbers of people from poor countries unable to sustain themselves in their home countries while locked out of rich ones, and enormous disruptions to both rich and poor countries as significant amounts of land go underwater. I have no doubt in my mind that later in our lives we will look back and be baffled by how little attention we gave climate change when we could have done more. In that light, the relatively uncertain potential for costs looks a lot less important than this opportunity to fight climate change.